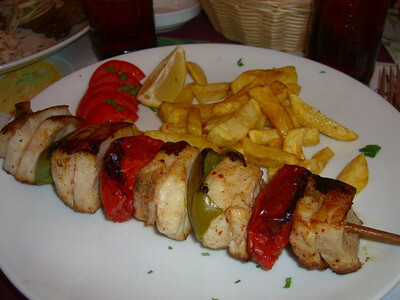 Perfectly grilled fish at Deniz Cafe in Turkmenbashi. Read more about Turkmenistan. 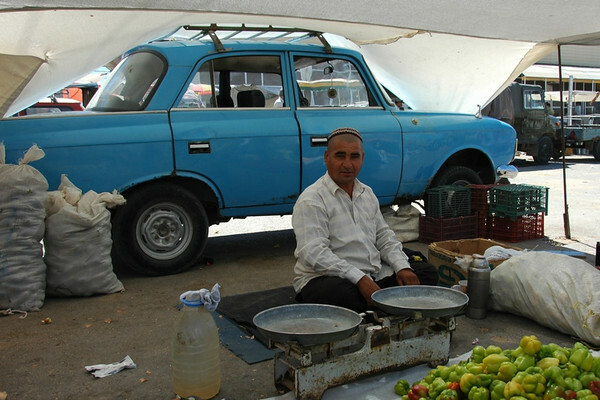 Our first impressions of Turkmenistan came from the big market in Turkmenbashi (which we visited in order to exchange money on the black market). ..We were all blown away by the smiles, friendly questions and colorful dress of the vendors. We had expected people to be more reserved and afraid of foreigners. Luckily, we were repeatedly mistaken. 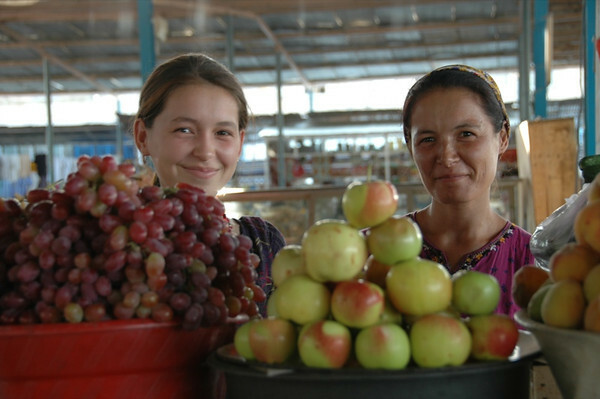 Read more about our visit to Turkmenistan. 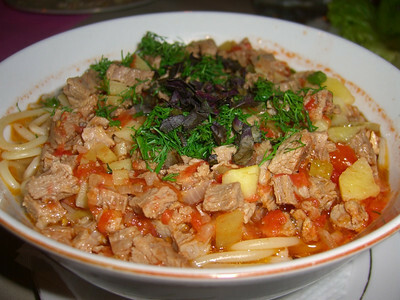 Laghman, an Uzbek soup-stew staple is chock full of spaghetti, potatoes, tomatoes, herbs and meat. 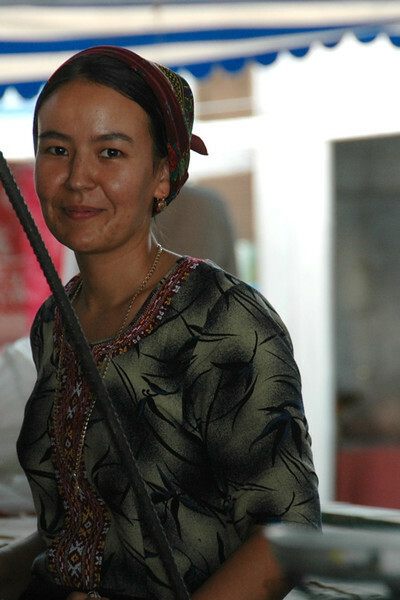 Read more about Turkmenistan. 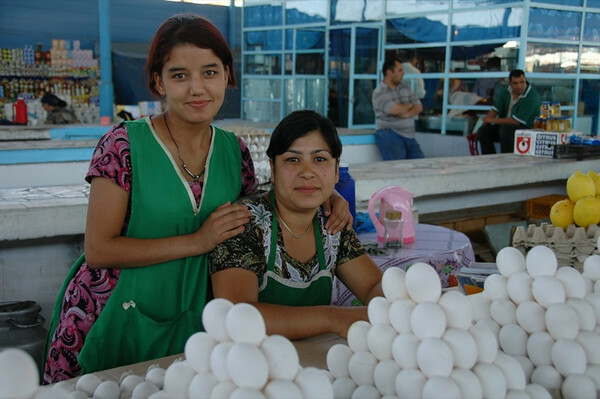 These sisters work together to sell eggs at the market in Turkmenbashi. 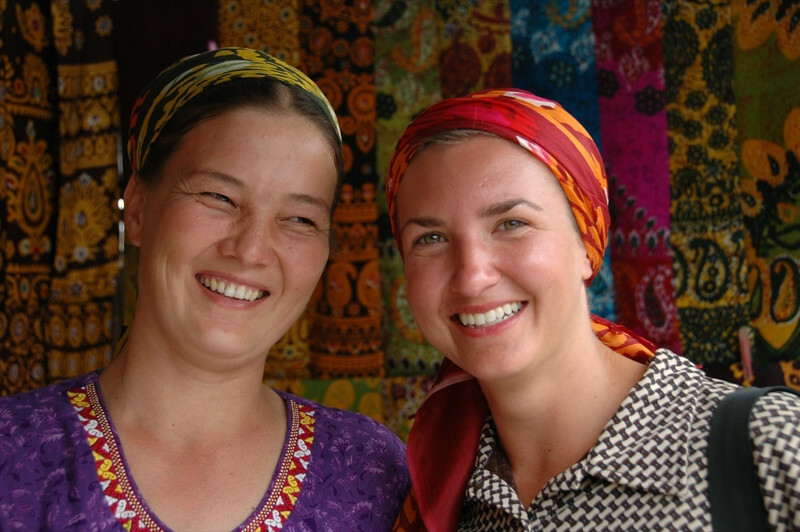 Read more about Turkmenistan. Our group was given a large plate of plov (pictured here - rice, vegetables and meat) and a meat stew by a family visiting Paraw Bibi. 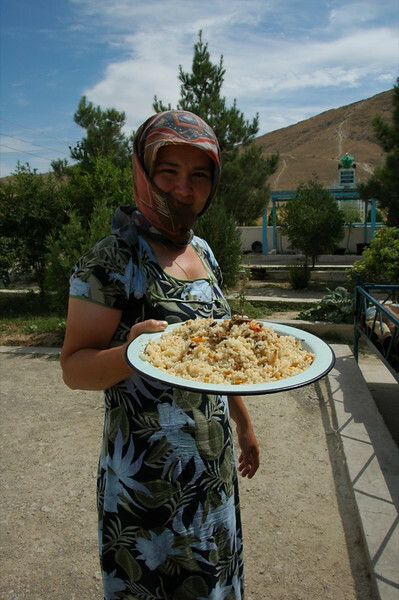 Dig deeper into Central Asian Cuisine and find out the best and worst of food and markets in the Caucasus and Central Asia. A shot of our first meal in Turkmenistan, at Deniz Cafe. Iskender kabab (or yogurt kabab) proved one of our best meals in Turkmenistan. 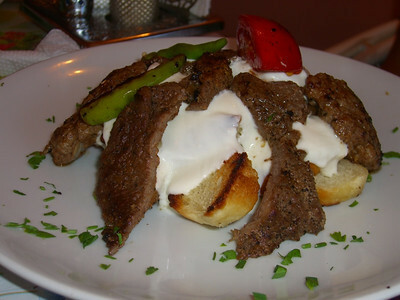 The combination of plain yogurt and grilled meat is delicious. ..A group of Peace Corps Volunteers at the cafe were as shocked to see us (American tourists) as we were to see them. Read more about Turkmenistan. 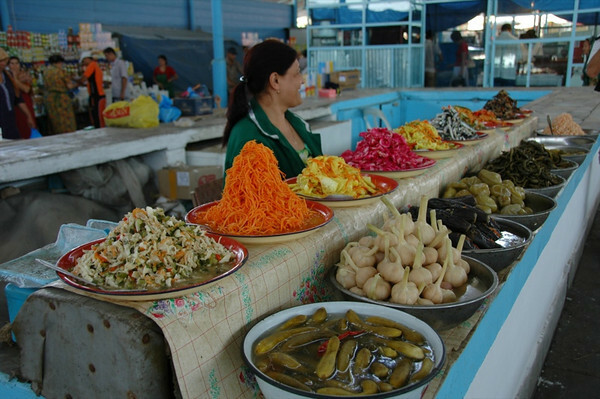 The stalls selling pickled vegetables and fish were always colorful...and fragrant. 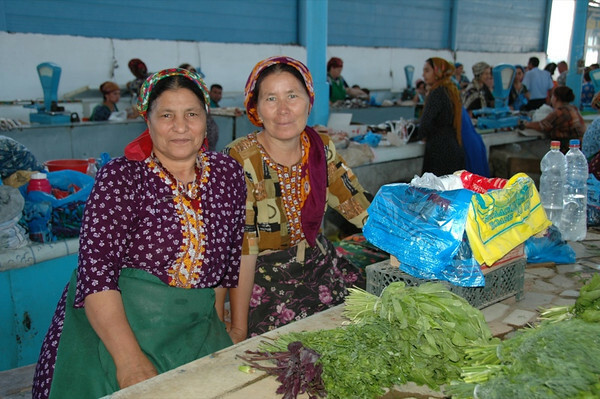 At the main market in Turkmenbashi, Turkmenistan. Read more about Turkmenistan. 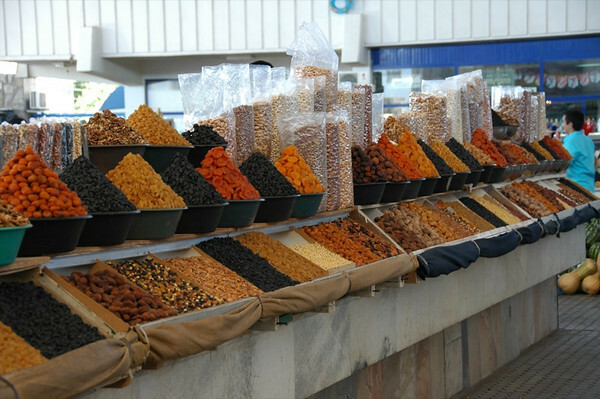 The selection and variety of dried fruits and nuts can be overwhelming. We just wanted to buy some pistachios for the ride to Darvaza and we were faced with the choice of five different varieties (Azerbaijani, Iranian and Turkmen)! ..We bought dried apricots instead. Read more about Turkmenistan. 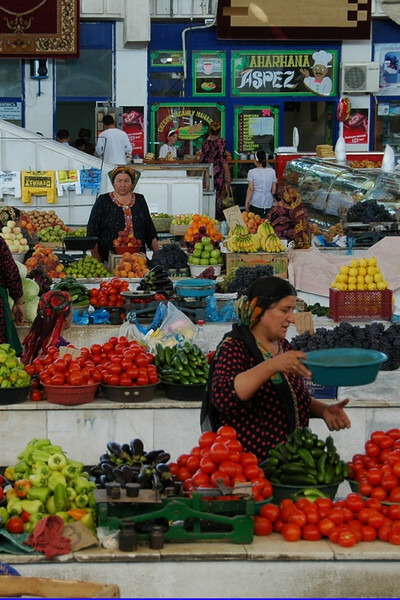 Ripened tomatoes stand out at Ashgabat's Russian Market (Gulustan). 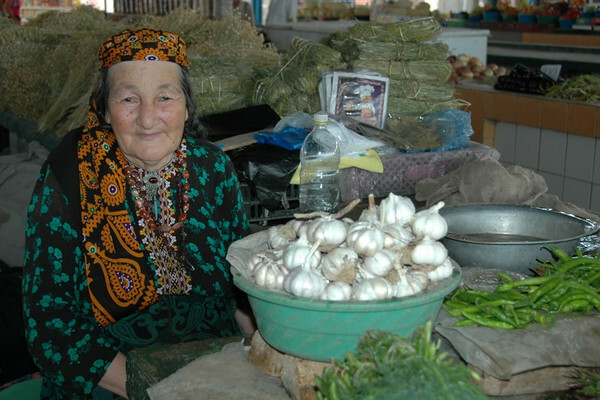 Dig deeper into Central Asian Cuisine and find out the best and worst of food and markets in the Caucasus and Central Asia. 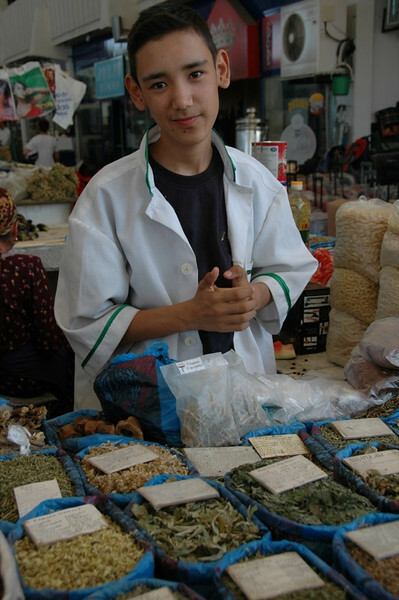 This herbal tea vendor plays the role of a doctor in his white lab coat at the Russian Market (Gulustan) in Ashgabat. Read more about Turkmenistan. 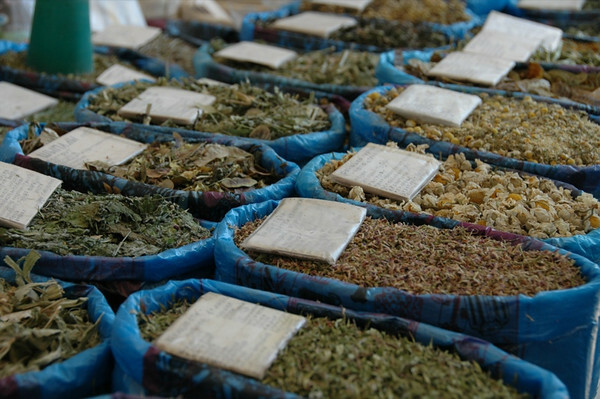 Herbal teas to soothe all ailments are on sale at Ashgabat's Russian Market (Gulustan). Read more about Turkmenistan. This colorfully dressed garlic vendor at the market in Mary reminded us of a Native American. 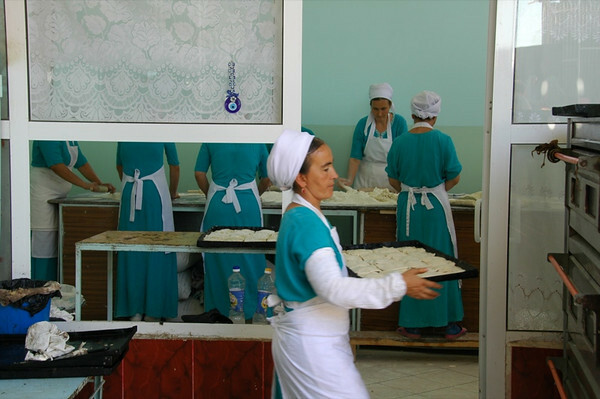 Dig deeper into Central Asian Cuisine and find out the best and worst of food and markets in the Caucasus and Central Asia. Stuffed with meat and steaming fresh from the oven, these pastries (somsa) at Ashgabat's Tolkuchka Market smelled and tasted delicious. Read more about Turkmenistan. Tolkuchka Weekend Market, Ashgabat Read more about Turkmenistan. 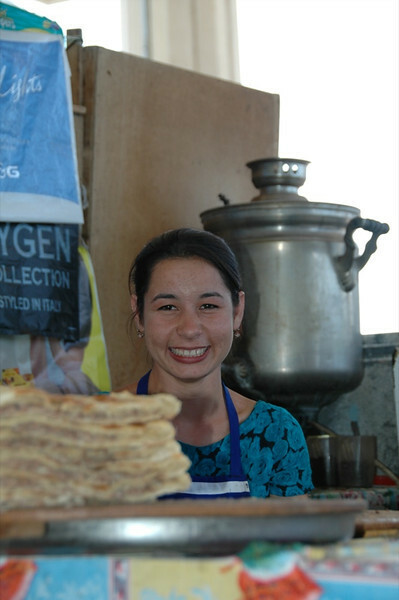 Another shot of friendliness from the market in Mary, Turkmenistan. Read more about Turkmenistan. This beautifully dressed vendor at the market in Mary, Turkmenistan was a little camera shy, but got a kick out of seeing her image in the LCD display afterwards. Read more about Turkmenistan. 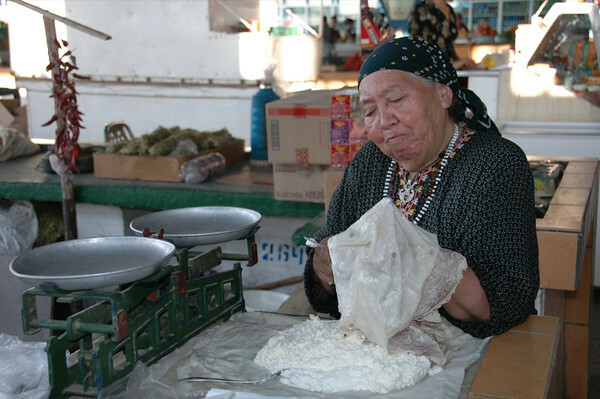 This woman scrapes the curd away from a cheese cloth at the market in Mary, Turkmenistan. Read more about Turkmenistan. The bride keeps a handkerchief at her mouth all day in order to resist the temptation to talk. The maid of honor seems to be having more fun than the bride. © UncorneredMarket.com Read more about Turkmenistan.